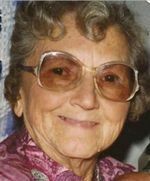 Ethel Maxine Hazen (nee Soliday) age 91 of Ashland, passed away at her home on October 1, 2010. She was born on June 7, 1919 in Bellville, Ohio to Arista and Leona Soliday. She retired in 1974 after working twenty years for the National Latex Company in Ashland and was well known for her pie baking for local restaurants. She treasured spending time with her family and she enjoyed doing stamped cross stitch, ceramics, and wintering in Fort Myers, Florida for over 30 years. Ethel was an avid Cleveland Indians fan and watched all of the games on television. She will be deeply missed by her sons, Roger A. (Lela) Hazen of Ashland and Thomas (Pam) Hazen of Lehigh, Florida as well as her sisters, Mabel Hoover, Barbara Cunning, Lois "Geri" Reiner, and Ruth Strater; brothers, Jack Soliday and Art Soliday; grandchildren: Jeff Hazen of Mansfield, Teri Pienoski of Sheffield Lake, Jennifer Tinch of Cincinnati, and John Hazen of Cardington; great-grandchildren: Jason, Nathaniel, Daniel, Johnny, Michael, Craig, Christine, Roger, and Elizabeth; great-great grandchildren: Samantha and Christina and many nieces and nephews. She was preceded in death June 8, 2010, by her husband of 72 years, Charles and her brother, Earl "Flip" Soliday and sisters: Martha "Mart" Scott and Evelyn "Eba" Long. Her family will receive friends Tuesday, October 5, 2010, from 6:00 to 8:00 p.m. at the Heyl Funeral Home, 227 Broad St., Ashland, OH., where funeral services will be held 11:00 a.m., Wednesday, October 6, 2010, with Chaplain Skip Snell officiating. The family suggests memorial contributions may be made to Hospice of North Central Ohio, 1050 Dauch Dr., Ashland, OH., 44805.